Plastering ranges from a variety of different services, but one of them specifically is coving. The art of coving has been around quite some years and most would argue that it really puts that adding touch to your home. 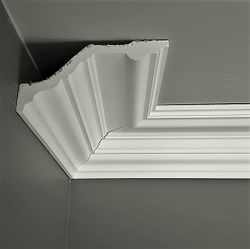 Coving, also known as molding and is used to cover the bridge gap between where the top of the wall meets a ceiling. Coving comes in all shapes and sizes, but a standard variation of one you might commonly see is shown in the image pictured below. Coving is usually installed to rooms such as the hallways, lounges, dining rooms, kitches and bedrooms. Apart from the fact that some may dislike the look of coving, there are very few disadvantages to coving. If not done by a professional, it can quickly become an extremely messy scene, as well potential cracks, breaks or scratches in the coving if bumped or roughened up. Coving was brought in through the Victorian era of when houses were first being built and has stayed pretty much ever since. Whats the reason? Because it looks great! However if you don’t really like the coving solution you can always leave it off of your things to do and just have your walls/ceiling plastered and skimmed. Need a quality & affordable coving in Kent or South East London?